Hang on to the warm memories of summer with this Jamaican favorite. 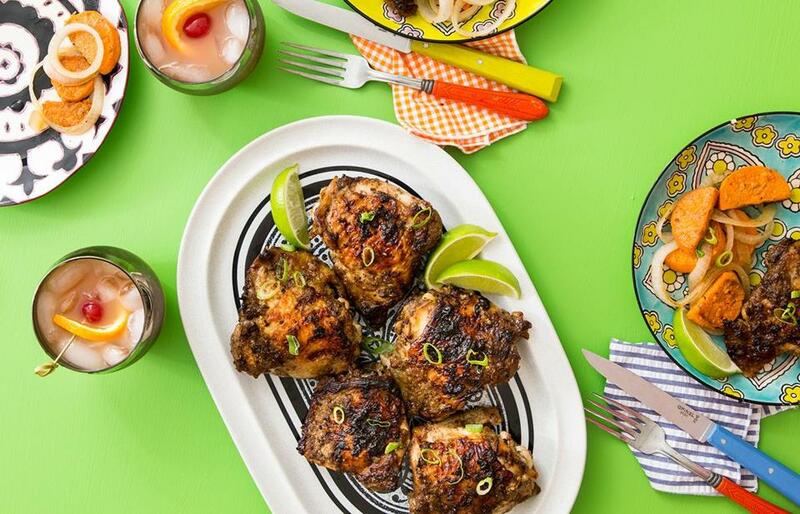 Photograph by anthony tieuli; food styling by Sheila jarnes/Ennis inc.
A classic jerk chicken menu. Before the cold weather sets in in earnest, recall sunny summer days by firing up the grill again for a tropical specialty — jerk, the characteristic barbecue from Jamaica. Jerk recipes vary widely, but the constants are Scotch bonnet chilies, scallions, thyme, and allspice (some would say ginger, too, but I favor cinnamon). Typically, the fire includes the wood of the pimento tree, which produces allspice berries. It can be found online, but I approximate the flavor by burning common allspice berries and bay leaves instead. Round out this menu with honey-lime sweet potatoes and Planter’s Punch, a classic rum concoction popular in Jamaica. To give the chicken some nice crusty caramelization, I don’t wipe the marinade off the thighs before putting them on the grill. But this increases the chances of flare-ups, so have your squirt bottle handy. For my tasters and me, 3 medium chilies provided a noticeable but not dominant spice that played nicely with the other flavors. Six chilies gave a pleasant burn that built slowly as we ate. The idea of using bay and allspice to generate smoke while grilling comes from Seriouseats.com. To a food processor, add all of the ingredients except for chicken, whole allspice berries, and bay leaves, and process to a loose, uniform paste. Scrape the mixture into a large nonreactive bowl or zipper-lock bag, add the chicken, turn to coat thoroughly, cover, and refrigerate for at least 6 and up to 24 hours. In a container submerge the whole allspice berries and bay leaves in water, cover, and set aside to soak while the chicken marinates. Prepare a medium-hot 2-level fire in a charcoal grill (with the bottom vents open) or preheat a gas grill on high for 15 minutes (if using gas, grill on medium-high with the lid closed). 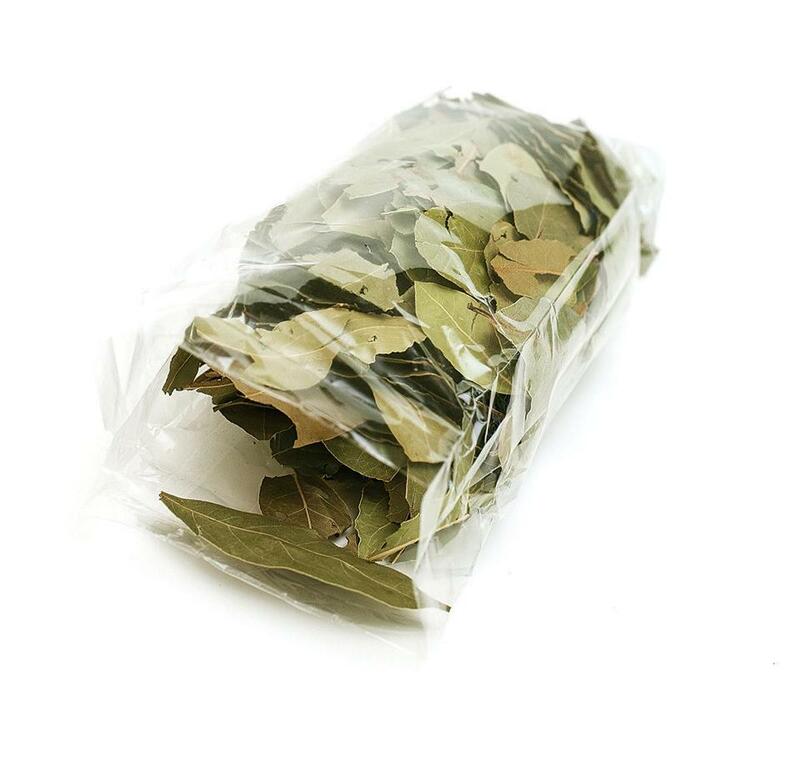 While the grill heats, drain the soaked allspice berries and bay leaves and seal them in a foil packet; cut several small vent holes in both sides of the packet. Place the packet directly on the charcoal or the primary burner on a gas grill and heat for 5 minutes. Clean and oil the grill grate. Grill the chicken pieces bone side down on the hot side of the grill, undisturbed (if the fire flares up, squirt with water or move the chicken to the cool side), until the meat is grill-marked, 4 to 6 minutes. Turn the pieces over and continue grilling skin side down, until browned and crisp, 4 to 6 minutes longer. Move the chicken to the cooler side of the grill and continue grilling. (If using a gas grill, leave the primary burner on medium-high and adjust the other burner(s) to low or as needed to maintain the grill temperature around 300 degrees, and continue to grill with the lid closed.) Turn the chicken occasionally until dark and the meat registers about 180 degrees on an instant-read thermometer, 25 to 45 minutes longer. Transfer the chicken to a platter, cover loosely with foil, and rest for 5 to 10 minutes. Thinly slice the remaining scallion and garnish the chicken with the slices. Serve with lime wedges. Meanwhile, in a small bowl, whisk the lime juice, honey, and pinches of salt and pepper to blend. Taste and adjust the seasoning with honey if desired, and set aside. In a large bowl, toss the sweet potatoes, onions, garlic, and oil to coat. Add the lime zest, ¾ teaspoon salt, and pepper to taste and toss to coat. Arrange 6 16-inch-long pieces of heavy-duty foil on a work surface and divide the sweet potato mixture among them, forming tidy bundles in the center of each. Place 2 sprigs of thyme on top of each sweet-potato bundle and fold the long sides of the foil sheets toward the middle, crimping the edges together and leaving some headroom. Next fold the short sides over several times to make tightly sealed packets. Place the packets seam side up on the grill directly over the flame and grill until the potatoes are cooked through, about 20 to 25 minutes. Remove the packets from the grill, open them, remove the thyme sprigs, and drizzle 1 scant tablespoon of the lime juice-honey mixture over each. Transfer contents to a serving bowl if desired, garnish with scallions, and serve. You’ll need a lot of bay leaves and allspice berries when grilling the jerk. If your supermarket doesn’t sell them in larger quantities, try an Indian or Pakistani food store, where spices are sometimes available in bulk. Or try big-box stores such as Target. There are two schools of thought about where Planter’s Punch originated — a Jamaican plantation or a St. Louis hotel — and many more schools of thought about its ingredients. The constants are rum, lime, and sweetener. This version skews a little fruitier and is likely more familiar to most people. Grenadine is a common addition that I replaced with pomegranate juice, but if you prefer a sweeter flavor, use ½ ounce grenadine instead. For extra dilution and some bubbles, top each cocktail with about ¼ cup cold seltzer. Fill a cocktail shaker about halfway with ice and add the rum, Cointreau, orange, pineapple, lime and pomegranate juices, and 6 dashes of bitters. Cover and shake to blend and chill, at least 30 seconds. Fill 2 chilled highball or Collins glasses about halfway with ice and divide the mixture between them. Garnish with a cherry and an orange slice, and serve at once. This is Planter’s Punch pared back to its refreshing essence. The basic formula is expressed in a rhyme: “One of sour, two of sweet, three of strong, and four of weak,” which translates roughly to 1 part lime juice, 2 parts sweetener, 3 (I use 4) parts rum, and 4 (6) parts seltzer or still water. Fill a cocktail shaker about halfway with ice and add the rum, simple syrup, lime juice, and 6 dashes of bitters. Cover and shake to blend and chill, at least 30 seconds. Fill 2 chilled highball or Collins glasses about halfway with ice and divide the mixture between them. Add half the sparkling water to each, stir, garnish with a cherry and an orange slice, and serve at once.